Earlier this week, the Environment Agency rejected an application from Midland Pig Producers regarding their proposed intensive, US-style factory farm in Foston, Derbyshire. The agency said it would “offend human senses”. However, the final decision rests with Derbyshire County Council and will be taken this summer. Please, add your voice at this crucial moment and join thousands of other compassionate PETA supporters who have spoken out against the cruel plans. Midland Pig Producers (MPP) has submitted an application to build an intensive, US-style factory farm in Foston, Derbyshire, that would imprison up to 25,000 pigs at a time and send 1,000 pigs a week to slaughter. Confinement indoors in crowded conditions causes pigs severe mental and physical stress. Pigs on factory farms are subjected to mutilations, such as having their tails docked and their sensitive teeth ground down without anaesthetics. Pigs on factory farms are denied the opportunity to engage in natural behaviour, such as foraging for food outdoors and building nests for their young. Confining so many pigs to one location will guarantee high levels of disease, infection and injury. Intensive farming also contributes to the spread of disease, including swine flu, to the human population. Pigs are usually transported to the abattoir when they are between 4 and 7 months old. They do not travel well, and many die or experience heat stress during the journey. Once they arrive, they are shackled and hoisted into the air, have their throats slit and are left to bleed to death. 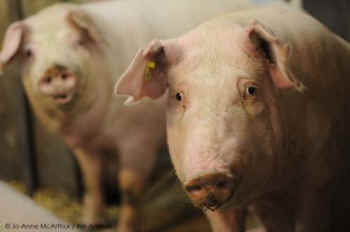 There are also fears that this pig "prison" could pave the way for more large-scale, intensive factory farms in the UK. We need to resist every step towards greater intensification of pig farming in this country. The application, which was withdrawn and then resubmitted, has been rejected by South Derbyshire District Council and is opposed by local groups, the Soil Association, Friends of the Earth and thousands of compassionate PETA supporters who have spoken out against it. In the latest development, MPP's plans have also been rejected by the Environment Agency because of the expected "significant pollution due to odour". However, the final decision rests with Derbyshire County Council and will be taken this summer. With reference to your representation in respect of the above planning application, I write to inform you that on 17 March 2015 the applicant withdrew their application.